We are now using cloth pretty much all day long. I change Isla into a disposable for overnights, but during the day, it’s all cloth, all the time. So far, I really love our cloth diapers. Most of the time, Isla is still in her prefolds and Thirsties covers, which are honestly much faster and easier than they are made out to be. I can get her changed in and out of a prefold just as quickly as I can an AIO or pocket diaper, and they are MUCH easier to clean. Kellen hasn’t had any problems with the prefolds, either, which leads me to believe that daddy boycotts of prefolds are a bunch of feigned helplessness hooey. 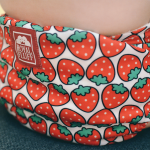 For AIOs and pocket diapers, we have FuzziBunz, bumGenius, Happy Heinys and Lotus Bumz in rotation. I’ve had a couple of problems with the FuzziBunz leaking out the back through the PUL lining around the tag. It’s a weird problem, but I’m hoping that running them through the dryer on higher heat for a short bit helps seal them up a little better going forward. The FuzziBunz have a really nice, customizable fit, though, and fit with a lot less bulk than any of the others. 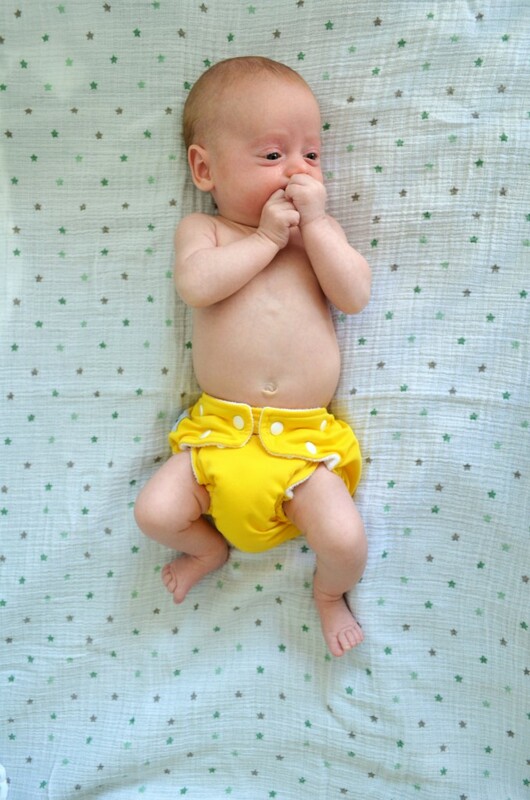 Our bumGenius pocket diapers are definitely the bulkiest of the lot, and while they are FAN FRIGGING TASTIC at absorbing lots of pee and keeping poops sealed in, they’re probably my least favorite in terms of fit. Happy Heinys are working out just fine. No complaints, and I like the fit. The fold-over snaps at the waist always take me a few extra seconds to figure out, but they’re super cute, and I love the colors that we have in the Happy Heinys. The Lotus Bumz are my favorite. The material is sooo soft, the prints so adorable, and I love how the insert is held in by elastic. No tucking or worrying about making sure all of the lining is actually in the diaper when you put it on. They do a great job of keeping in #1’s and #2’s. They’re heavenly. 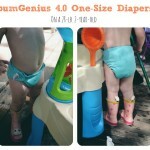 I have one Bumkins AIO that I just received (got a great deal on Zulily.com.) I tried it out once, but I’m not super impressed with how it absorbs, and it takes forever to dry. Isla wore it for maybe an hour, and it was completely soaked through and held the moisture against her skin. Fine to have in rotation, but probably won’t be buying any more. We’ve only got 12 pockets and AIOs, and I’m hoping that when Isla grows out of the prefolds, we can transition entirely to AIOs and pocket diapers, since she’ll be at daycare most of the day, and I think they’ll probably be easier for daycare to keep up with. I want to try out Oh Katy, Charlie Banana, and maybe a couple of others before I commit to buying a whole bunch of any one thing, but right now, the Lotus Bumz really have my heart. 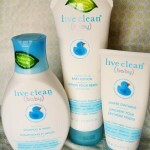 Do any of you have a favorite brand that you’d recommend? I mentioned in another post that we got a diaper sprayer to help with serious #2’s and to keep our diapers from getting stained. I can’t say enough about the toilet sprayer. I’ve heard that a lot of similar products tend to leak, but we’ve had no issues in that department. It’s so easy to use, too, and I think if you’re planning to cloth diaper, having one of these sprayers could help take some of the yuckiness out of the prospect of reusing a dirty diaper. Particularly if your husband is like mine and was initially really grossed out by just the idea of having to handle a poopy reusable diaper. Speaking of, my husband, who was initially not at all on the cloth bandwagon, primarily because of having to deal with pee and poop twice–once at the initial diaper change and again when you do laundry–has admitted that cloth diapers aren’t nearly as scary as they used to be. After you’ve been pooped, peed, and spit up on, handling a diaper is really no big deal. If your husband is scared of dirty cloth diapers, tell him to man up. It’s just a little baby waste. My only real outstanding issue is using cloth overnight. I’m not comfortable with Isla having that much wet against her skin for 8+ hours, so we’ve been using disposables which seem to do a better job of keeping moisture off the skin. At the same time, we’ve had a few issues with leaks first thing in the morning, and I’d really like NOT to have to maintain two separate systems of diapering. Since we don’t have a pail for disposables–hard to justify, since we only use 7 sposies a week–I’m having to put the dirties in ziploc bags before I put them in our kitchen trash can, and the smell still leaks out. It’s a disgusting thing to have in your kitchen, and I’d just like to switch to full time cloth to keep the smell contained to the pail in Isla’s room. One person recommended Kissaluvs hemp fitted with regular Thirsties covers overnight, but I was wondering what other overnight solutions other people are using. If you’re cloth diapering at nighttime, is there anything you use that keeps moisture in but doesn’t irritate baby’s skin? Cloth diapers so far have not been nearly as scary as they’ve been made out to be. Even prefolds are pretty simple–and definitely have their bonuses–once you get the hang of them. Seriously, a much easier undertaking than trying to exclusively breastfeed. If I’d known how simple it was, I probably would have made more of an effort to get Isla into cloth diapers sooner. Oh, well. We’ll know for the next one. If you’re thinking about cloth diapering, though, I strongly recommend it. It’s really not bad at all. At worst, it’s 2 extra loads of laundry a week, and after a baby, that’s barely a drop in the bucket. I’m glad that cloth is working out for you. My husband was hesitant at first too, but when he didn’t keep having to go buy diapers, he came around. She’s precious!